U.S. News and World Report ranked the Sandra Day O'Connor College of Law ____th nationwide for law schools. Where did Tempe USG host presidential candidate debates this week? What days can students vote for their candidates of choice in the ASU Student Government election? Which restaurant had its grand opening last week and is now located on the first floor of ASU's downtown dormitory, Taylor Place? Which ASU building currently under construction is now offering tours to the public? 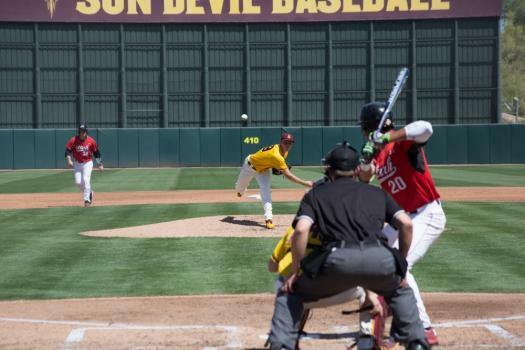 Which ASU baseball player threw a no-hitter this week over Utah? This week, ASU softball swept _____, improving to a season record of 25-9. This week, ASU women's golf competed in San Diego's Mayhem at The Farms tournament and placed ___th. The Arizona House Elections Committee held a hearing Monday to discuss and learn more about what? Why Maricopa County reduced the number of polling locations from 200 to 60 over the past four years. The rise in voter turnout of young people. Current Arizona voting ID laws. Proposed design changes to the Arizona voter ballots. ASU basketball player __________ announced Monday he will transfer from ASU to elsewhere.